Before we get started today, let me preface this post by saying I am not from Wisconsin (as if y’all didn’t know that by now) and I’d be hard pressed to find Sheboygan on a map anywhere (ok, out of curiosity I just looked it up and I can now find it on a map). Why bring this up? Seems like Sheboygan is the Brat Capital and from what I’ve read they have very strong opinions about brats, how they should be cooked, what kind of condiments should be used and even what kind of buns they should be served on. They take pride in their brats, much the same way as the Carolinas feel about pulled pork, St. Louis feels about ribs, California feels about tri-tip and us Texans feel about brisket (and every other thing we barbecue because we do it better in Texas 😉 ). And I can respect that….but that doesn’t necessarily mean I’m gonna do it their way just to avoid making somebody mad. I’m actually expecting (and kind of looking forward to) somebody from Wisconsin chiming in and pointing out how I screwed up and how they should never be done this way. So all that being said, let’s get on with the food. Seems like there are 3 main camps on the proper method to grill brats (BTW, when I say brats I mean the raw, uncooked brats. No self respecting person from Wisconsin would buy pre-cooked brats and neither will this Texan). Grill the brats directly over a medium heat until browned and cooked through. Serve up immediately. Grill the brats directly over a medium heat until browned and cooked through and then hold them in a bath of beer, onions and butter until ready to serve. Simmer (not boil) the brats in a beer and onion bath for about 20 minutes. Then, grill the brats until browned and cooked through. Serve immediately or return to a bath until ready to serve. I’ll let you argue amongst yourselves over the correct way to do it and the pros and cons of each. Whichever way you choose, be careful and make sure to never pierce the casing of the brats or allow the casing to burst from too much heat. This will cause the juices to leak out and you will be left with a dried out sausage and nobody wants that. And here, more than likely, is where I will catch flack from anybody out there from Wisconsin. I ditched the whole bath of beer, onions and butter and replaced it with sauerkraut, my own blend of spices and a bottle of Shiner Bock (had to throw in a little Texas flavor). Why sauerkraut? Because I think it goes well with brats and I don’t care if some people may frown on that. I’m in Texas and I’m gonna do things my own way! So take that! 1 package of buns, most likely you will not be able to find the Sheboygan hard roll outside of Wisconsin, so look for something like a hoagie roll or a bollilo that will hold up to the brats and condiments. Try to stay away from hot dog buns. 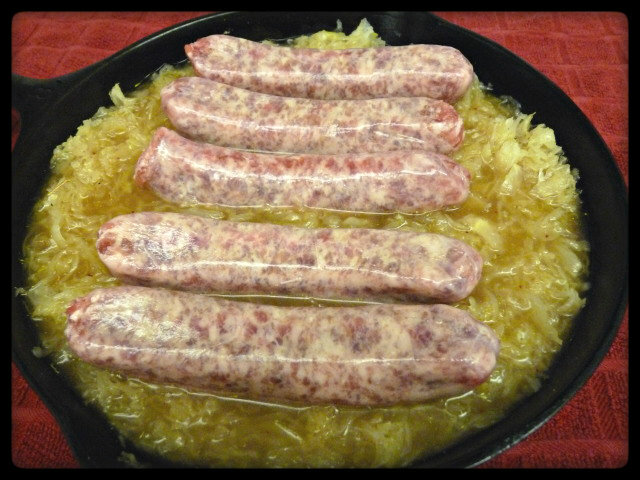 Place brats in sauerkraut beer bath and place onto a grill heated to medium. I went 400F on my Egg. Allow to simmer, not boil, for about 20-30 minutes. You want to see steam coming off the mixture, but not a boil. Remove brats from bath and grill direct for 5 to 10 minutes, turning often to prevent casings from splitting, until browned and sausages reach 160F (the brats will carry over to 165 at this point). Serve immediately or return to sauerkraut beer bath to hold until ready to serve. So was this a true method to cook brats? Probably not (and do I care? Probably not). Was it easier? Maybe a bit. I didn’t have to worry about charring the brats or having the skin burst while they were cooking in the bath (I actually went inside and watched tv). It was a bit more time consuming than grilling them directly, but that just gave me time to drink another beer. 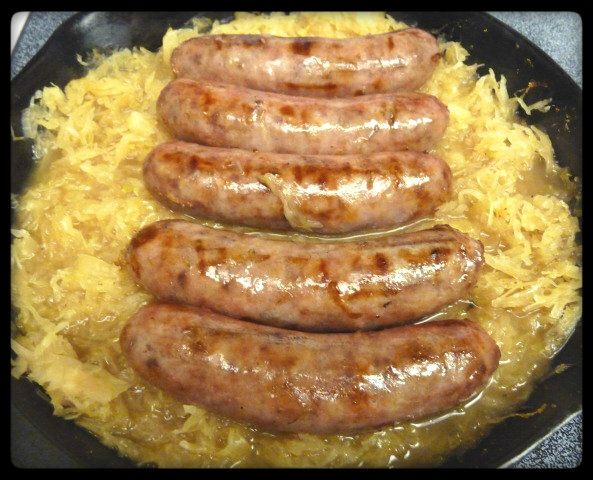 Did the sauerkraut beer bath impart any flavor to the brats? Not that I could detect, but hey….I had to cook the sauerkraut anyway, so why not do them together? I was able to cook the brats all the way through and get them nice and brown with some grill marks without one of them bursting and losing precious juices, which was good. Ok, ok….so I wasn’t really drinking a beer. It was a bourbon and coke so sue me. 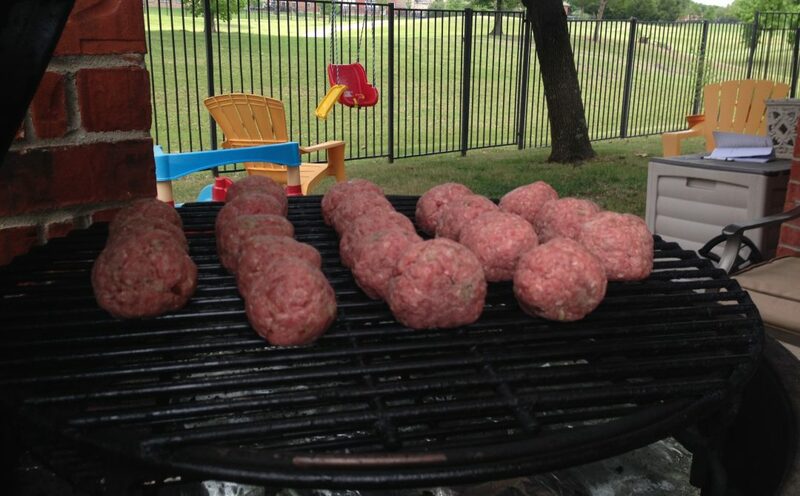 I’ve always been in the camp that just grills the brats directly. I tried the beer bath method a hundred or so years ago, but I find the simplest way to do brats is grilling them directly. I have just never understood the idea of boiling sausages (or hot dogs or gasp….ribs) unless you were looking for pork flavored water. But I do think the brats added a bit of pork flavor to the kraut and since it was going back on the brats in the end, why not? So I do think this method does have some benefits. Will I do it again? Probably. Always? Probably not. So pick a method and grill some brats. Or try all three and see which one works best for you. All I know is that it sure did get me in the mood for our upcoming trip to Germany next month. Can’t wait to try some authentic German food and I’m looking forward to their sausages and beer. And more beer. And then some more after that with another sausage. Prost! 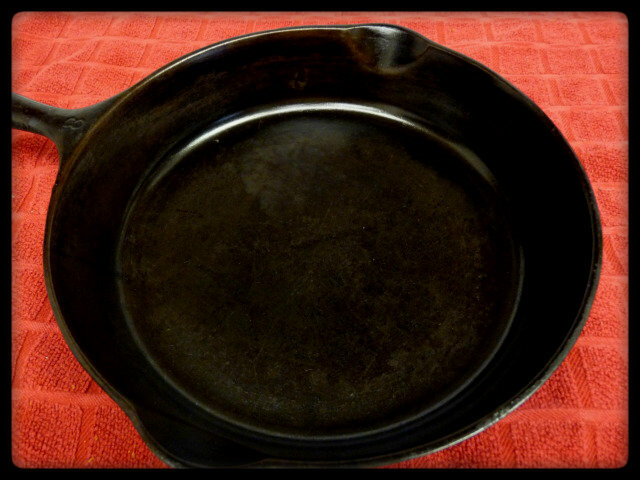 I could eat that WHOLE pan. All by myself. In fact, I don’t even need the brats. Just gimme the beery sauerkraut. Jen, Jen, Jen….a girl needs her protein. Give some love to the brats, too. I received my brat education from a deli owner here in east Texas — he was a Sheboygan native. But I still don’t do it his way. When it comes to brats, I usually just grill and serve, although I simmered them in beer a couple of weeks ago and finished them on the grill. So, the beer didn’t impart much flavor? My guess is, the hops and yeast lost the battle with the kraut. Consider cooking the kraut separately. 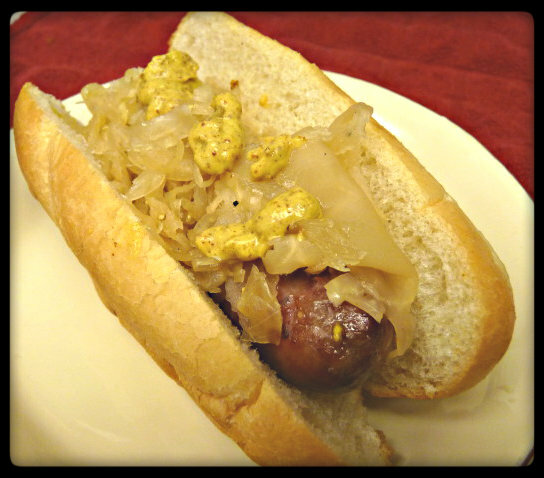 I think you’ll find that the brats have more of a beer flavor — even topped with kraut and brown mustard. Also, consider replacing that bock with a strong lager or even (the Beer Advocate folks will take away my mug for this) Milwaukee’s Best Ice. (You can get a 32 oz. can for $1, and they’ll even put it in a little brown paper sack for you!) This is a good cooking beer, because it’s heavy on the corn and yeast. And that, my friend, will leave behind plenty of flavor before it evaporates. For drinking? Stick with that (bourbon?) and cola I see in the pic. You could be right on the battle with the kraut. I just don’t think much beer gets absorbed through the casings. Usually I do cook the kraut separately and just grill the brats directly, but it did give the kraut a nice flavor. You know what they call that brown paper sack that they wrap the can around with down in South Texas? A Mexican Koozie. I’m not making that up or trying to be racist. I grew up in Corpus and that’s what my Hispanic/Latino/Mexican (whatever the PC term is now-a-days) friends would call it. Think I will stick with the bourbon. You reminded me…I’m out. Time to head to the store. Looks great! While I also usually just grill them up, the method you’ve described does turn out the best-tasting brats, IMHO. 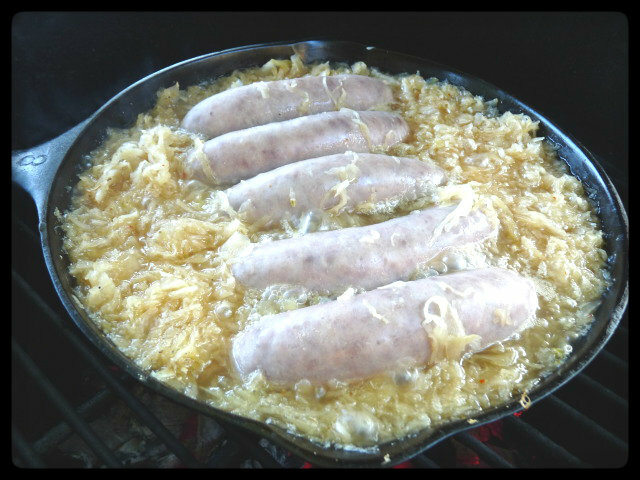 When I do it I start with a little onion and garlic in the pan, cook that until softened, then add the kraut and beer. Try a fermented kraut (your German meat markets should have it), whole different taste, much fresher. And thank you for swinging by my way. Can’t wait to check out your blog more. Oh Brian! You don’t want to let them explode. All the juice and flavor runs out that way. Try this method and see how it works for you. Yum!! Actually just made my own sausages from scratch for the first time over on my blog! Now I have to figure out how to make bratwurst, this looks too good! Ps. I was thinking next time you should try searing them directly on the grill and then finish them in the sauerkraut beer bath! I checked out your blog last night and the sausage you made looks great. Much respect for people who grind their own meat and stuff their own sausage. I’ve enjoyed getting into making sausage and have already decided that bratwurst will be my next attempt. Last night I ground up 3 lbs of chuck, but that’s for burgers tonight with the leftovers being frozen for a later use. 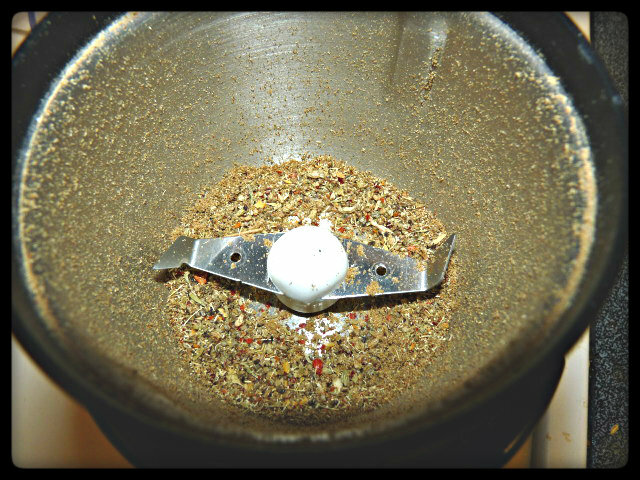 Yeah, after doing the meat grinding in this manual old meat grinder I have a lot of respect for it too! If you figure out a good brat recipe I hope you post it! But of course. I’ll be doing some research this week to come up with one. I can tell it’s been a long week when the bourbon and coke looks like the best thing on the page. 😉 The hubby is a brat and sauerkraut fanatic so I may give this method a shot… looks yum! Sorry to hear that. Kinda been the same here. I know its cliche, but TGIF. Funny you should mention Sheboygan, I’m heading there next week for the Brat Days festival. I have cooked brats all three ways that you mentioned and don’t find that any is the “best”, I like them all. I am sure that I will learn a LOT during the weekend. I’m going to talk to a ton of people and listen to their ideas. Should be fun. Sounds like a good time. Can’t wait to see some pics. I really like the Simmered in Bear and Onions method as it tenderizes the Sausages for me. I then Grill them until Golden Brown and saute the onions to top them off with the spicy brown mustard. Then again I am from Missouri now but still use the method I learned back in the Chicago area. Oh, and Hotdogs should be steamed. So, I made this yesterday using a different method! I used the crock pot. I always get these bright ideas to put something into the crock around noonish, so I had to adapt. Kraut, beer, onions, and bay leaf went into the crock and then into the oven for about 11/2 hours. Kraut really needs to cook to get soft and caramelized. Took the crock out, added the sausages, and into the crock pot for a few hours. The kraut had the added advantage to cook a little longer, and it was tender, and caramelized. I had 4 grandkids here, and trying to bake some Christmas treats, and the sausages got a little overcooked but still delicious. We were out of New Castle, so I had to use a Corona. 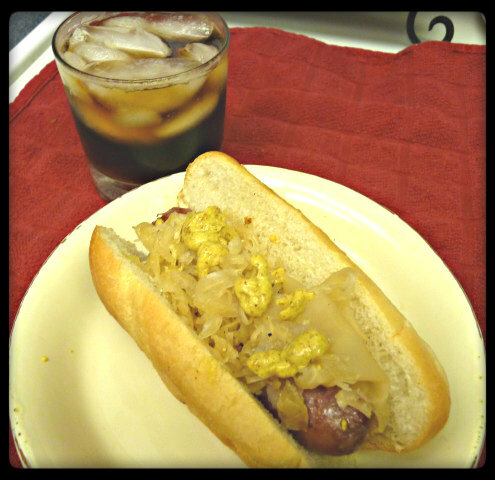 Actually, Johnson ville sausage is quite tasteless to me, so the kraut, beer, and onions gave it a tasty boost. Thanks for sharing. 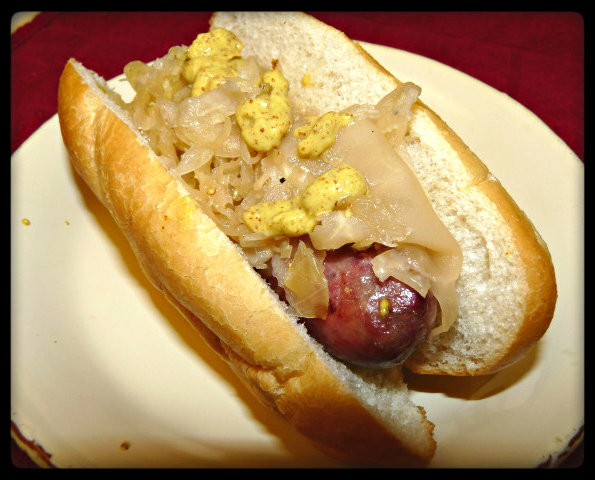 What you have here is an excellent recipe for fresh kielbasa and kraut. 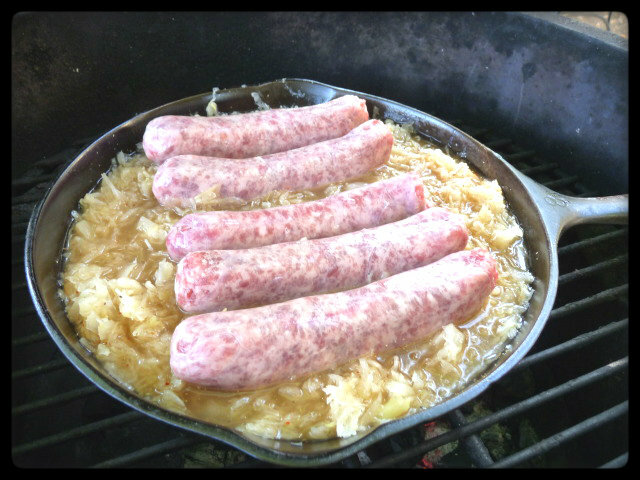 Except I’m in the grill first then simmer camp, so I grill the kielbasa then put it in the kraut bath. If you make it up to Milwaukee, do yourself a favor and pick up some Usinger’s fresh kielbasa. They’re located on Old World 3rd St. downtown. And visit the Spice House across the street. You can thank me later. As for brats …. beer, baby! Beer! Thanks, Ed. That post was from so long ago, I had to go back and re-read it to see what the hell I was talking about. If I ever do, I will and I’ll thank you for it.